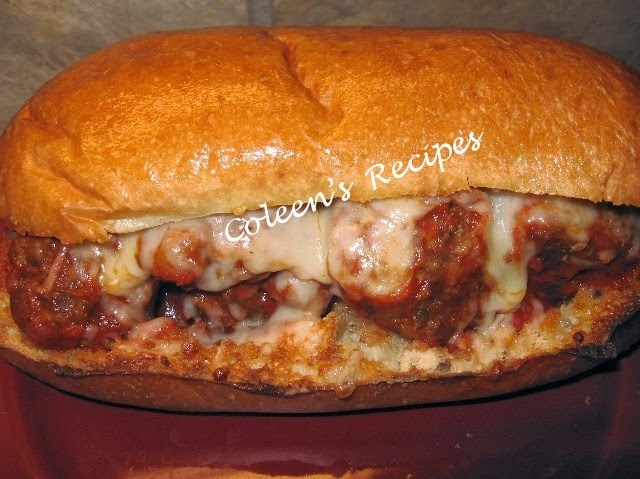 Whether you make this on the cook top, or in a crockpot (see directions below), this meatball sandwich is heavenly!! It is rich, satisfying and total comfort food....so, live a little and ignore the calories this weekend!! The aroma of these meatballs, simmering in the sauce, will pull(even the pickiest eaters) from all corners of your house. For the full size sandwiches, use hoagie rolls, or for a crowd, small dinner rolls make great meatball sliders!! This recipe will feed a crowd, so if you are just feeding the family, cut the meatballs in half. Better yet, make the whole recipe and mix the leftovers with pasta and Parmesan tomorrow night!! I love "day two" recipes. Saute chopped onion and garlic in a tablespoon of olive oil, until the onions have mellowed and become a little sweet. Mix them in with all of the other meatball ingredients. Form into 2” meatballs and place on a cookie sheet (that has a rim) and bake at 350° for 15 minutes. Remove from oven and drain. Set aside. Even if you cut the meatball ingredients in half...do not cut the sauce in half. You can make this sauce on the range or in the crockpot. Bring to a boil and stir to thoroughly mix everything. Reduce heat to a simmer and add the pre-cooked meatballs to the sauce. Simmer for 2 hours (or see crock pot directions below). TO SERVE: split your bread roll and put just a skim of butter on the cut side and toast it (for just a minute or so) under the broiler. Remove and load with meatballs and mozzarella cheese and put back under the broiler to melt the cheese. Enjoy!! The recipe ingredients are the same, except use 4 cups of HOT water and crockpot on HIGH for 5 hours. Lay a dish towel over the crockpot lid (to insulate it a little, so it will come to a simmer quicker). Once it comes to a simmer, remove the towel and crack the lid open just a little bit so that the sauce will reduce a little. NOTE: The secret to this recipe is the length of cooking time - NO SHORTCUTS ON THE COOKING TIME......that's the secret. The meatballs taste AND texture will be SO MUCH BETTER if you cook for the full amount of time, that's why the crock pot is the perfect method to make these sandwiches.